Secret Santa pokies is a 1024 ways to win slot set to a delightful Christmas theme. Featuring Christmas themed symbols including Santa Clause, Bon Bons, Christmas trees, stockings filled with presents and Christmas crackers, this will surely get you into the holiday spirit. Jam packed with a mystery bonus feature which is triggered at random, you could win free spins, various wild bonuses and 5x or 10x multipliers. To really get your heart pumping whenever you win 5 of a kind there is a chance you will hit another 5 of a kind which is spun up on your reels. Who knows, this Christmas you might get lucky on this slot. 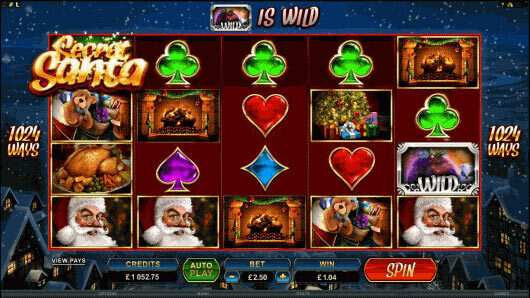 Join Santa in this fantastic Christmas themed online pokies from Microgaming, enjoy the free game above. The main bonuses are below and can be triggered randomly at any time, there is no need to hit scatters in this slot..
Just like Christmas Day this slot delights with present after present and is an excellent game to enjoy playing on Christmas day.